← Quick…When I Say Salesmen What Comes to Mind? I have been studying and practicing the art of selling for over 40 years. 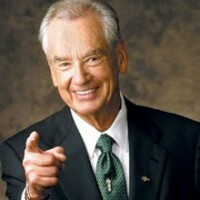 My favorite mentor is one of the greatest sales trainers of my time, Zig Ziglar. I’ll never forget my first live training session with him in the early 1970’s. His first book was titled, Biscuits, Fleas, and Pump Handles and was self-published. It was later titled See You At The Top. His views on attitude have had a profound impact on my life. Watch this video to get a taste from a master of selling. I still refer to my signed copy of See You at the Top by Zig Ziglar. I have long since worn out the audio sales training tapes that became the foundation for my sales training. Although the book is a classic, the basic principles that Zig teaches are still relevant. This entry was posted in Consulting, Marketing and Advertising, Selling and tagged mentor, sales, sales-mastery, teacher, Zig-Ziglar. Bookmark the permalink. I think Zig is single-handedly responsible for making the work “salesman” an honorable one!